After-sun nourishing shampoo for all hair types. 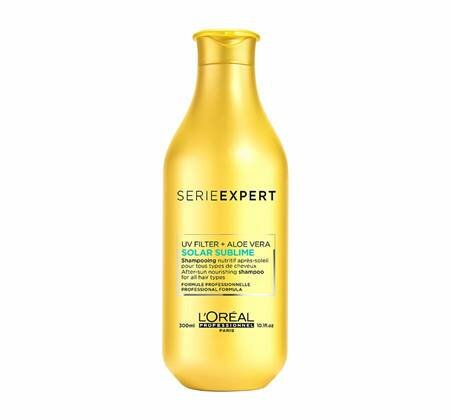 PROFESSIONAL FORMULA enriched with a UV filter, Aloe Vera and Vitamin E. It deeply cleans and nourishes the hair fibre to help to counteract the drying effects of sun, salt and chlorine. With a lightweight touch the hair fibre is smooth and radiant. To use: Apply evenly on wet hair. Lather. Rinse thoroughly. In case of contact with the eyes, rinse them immediately and thoroughly.